Smooth 6-7" heads of tightly formed white curds are solid, crisp, and tender. This variety is well-suited to being eaten raw, baked, roasted, or steamed. Can be overwintered for an early crop in warmer regions. Introduced to American gardeners in 1878 by Peter Henderson & Company. 60-85 days from transplant. Instructions - Sow seeds indoors ¼" deep. Plant out just before the last frost. 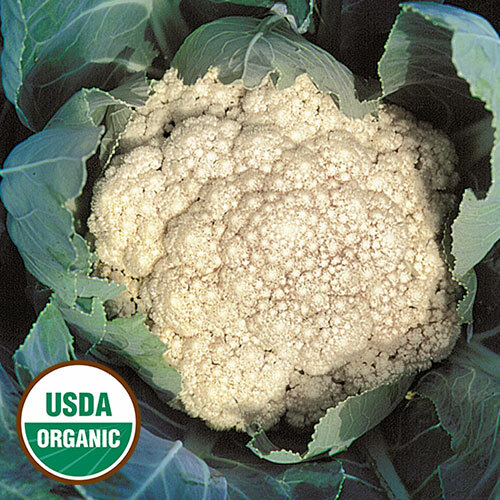 Cauliflower prefers cool temperatures and a steady supply of water. Tying leaves around heads to blanch is not necessary, but the practice helps prevent yellowing of the creamy white curds.